Archimedes is famous for being Ancient Greece’s greatest engineer. Yet a random discovery – a prayers book found in an old church in Turkish Istanbul, casts this mysterious genius in an even more surprising light. The year is 212 BC. The place–is the fortified walls of the Greek city Syracuse, at the shores of the island of Sicily. A great fleet of Roman battle ships was approaching the city from the east, and thousands of elite Roman Legion troops were getting ready to attack by land from the west. The Roman army was led by Marcus Claudius Marcellus, a brilliant general and the man who killed the king of the Gauls, Rome’s sworn enemy, with his bare hands. We can safely assume that not many in the ancient world would be willing to trade places with Syracuse’s defenders. The Roman ships neared the city walls – and the Greek defense came alive. Catapults placed behind the walls hurled giant rocks towards the approaching fleet. Some ships were damaged, but the Romans pressed forward: catapults were a common weapon in the ancient world and the Romans expected the attack. They also knew that catapults had a roughly fixed range, so as the soldiers neared the walls, more and more of the rocks would pass over their heads and the artillery would become useless. They rowed on, closing the distance towards the walls – but something strange and unexpected happened. The rocks – big, small, sharp, and serrated – continued to fall on the Roman ships. The Greek catapults, it seemed, were somehow able to modify their range of attack! Marcellus spurred his troops onwards through this rain of ruin and destruction. The ships that survived the artillery clung to the fortified walls and the soldiers prepared to climb them – but another surprise awaited them. From within the walls emerged great beams with big metal hooks, like giant fishing rods. The Greek defenders aimed the beams left and right, up and down, until a hook connected with a ship’s hull. And then, the impossible happened. With great force, the beams lifted the Roman ships into the air, as if they were little fish. One after the other, the Roman ships were caught in the pointed claws of the Syracuse’s machines. The flailing ships capsized or were slammed forcefully into the walls while the frightened soldiers were thrown into the water. The Roman fleet retreated, licking its wounds – but Marcus Marcellus did not give up. He reorganized his troops and prepared to attack at night. Under the cover of darkness, the Roman ships clung once again to the city’s walls and the soldiers climbed them. And once again, the defenders were ready with yet another surprise: thousands of metal arrows fired from tiny holes, hidden in the walls. The Romans panicked. As they retreated back to safety, one name was on their lips: Archimedes. These were the works of Archimedes. The land forces that attacked Syracuse from the other side received their share of artillery and arrows as well. Marcellus realized that as long as the mysterious Greek genius was responsible for Syracuse’s defenses – his army didn’t stand a chance. The general decided to change his tactics and laid siege to Syracuse….but from afar. The siege of Syracuse was one of the greatest military dramas of the ancient world. But before we return to our story, let’s take a closer look at the mysterious genius whose machines humiliated the Roman army. Surprisingly enough, we don’t know much about Archimedes’ personal life. We know was born in Syracuse in 287 BC, but we don’t know much about who his parents were, or whether he was married or had children. Most of what we know about Archimedes comes from scholars who wrote about him well after his death. And yet, even though we don’t have a lot of information about his personal life, we do know quite a bit about his professional work from notebooks and manuscripts on math and mechanics that he left behind. What we know about Archimedes raises a fascinating question, which will be the focus of this episode: what effect does the surrounding environment have on our perception of a person’s achievements? Archimedes was a gifted inventor and engineer, no doubt about it – but he didn’t live in a vacuum. He lived at a certain period, at a certain place and was surrounded by other people. All these external factors had to have some influence over his life – but how much influence, if at all, did these external forces have on our modern perceptions of Archimedes’ extraordinary talents? Back to Syracuse and the 3rd century BC. Except for the Greeks, there were two other major powers around the Mediterranean Sea. The first was Carthage, a Phoenician colony in what is now Tunisia, which was a rich and prosperous city. The second was Rome, which at that point in history was still a republic. The Phoenicians coveted the island of Sicily due to its strategic location in the center of the Mediterranean. Carthage constantly interfered with Sicily’s politics, and at times, even sent military forces in order to try and take it over. Sicily was important to the Romans since it was a valuable source of grain, and the Romans weren’t thrilled about Carthage’s attempts to take over the island. Over the years, the tension grew between the Romans and the Punics – as the Romans called the Phoenicians, until in 250 BC, a war broke out between them. The war ended with Rome taking over large Sicilian territories. Syracuse, in eastern Sicily, was an independent kingdom ruled by King Hiero [HIGH-RO] the Second. Hiero initially supported Carthage, but the Roman success convinced him to switch sides and sign an alliance with the republic. It was a smart move: this alliance ended up being very successful and gave Hiero fifty years of stability and economic prosperity. Archimedes, who was a close friend of King Hiero, benefited from this stability too. It allowed him to focus on his favorite field of research: mathematics. For example, one of his greatest accomplishments was the development of methods for calculating the values of pi (π) and the square root of the number three with extraordinary accuracy – an accuracy that no one was able to match for the next fifteen hundred years. Even though Syracuse, where Archimedes lived, was located outside of the Greek mainland, far away from Athens and Sparta – its population spoke Greek and shared the Greek Culture. One the most notable aspects of Greek culture was that the Greeks valued pure science: that is, research purely for the sake of research, instead of research bent towards more practical end goals such as better construction methods or machinery. Archimedes, being a product of this culture, preferred pure math over engineering. However, Syracuse was also close – both geographically and culturally – to Alexandria, another Greek city that was a significant cultural center of the time. As a young man, Archimedes studied for some time in Alexandria, and there he absorbed a completely different approach to science. The Alexandrians – as were the ancient Egyptians before them – were practical people, and it seems that even though Archimedes preferred pure math – he did learn how to put his mathematical knowledge to use in more practical endeavors. For example, according to some evidence, while in Alexandria Archimedes designed a clock based on water flow that was extremely accurate. Another possible example of this practicality is the famed “Eureka” story. It begins with a task given to Archimedes by King Hiero. The king hired a goldsmith to make a golden crown of a certain weight; for the sake of explanation, let’s say it was one pound. When the Goldsmith handed the king the completed masterpiece, it did weigh one pound – but the king suspected that the goldsmith replaced some of the gold with silver – a cheaper metal. Therefore, the king asked Archimedes to figure out the actual gold content of the crown – without damaging it, of course. Legend has it that Archimedes devoted all his time to thinking about how to solve this problem; so much so that his servants had to drag him to the bathroom to wash – and while soaking in the hot water, Archimedes continued thinking about the problem, drawing shapes and figures on the soap covering his body. Archimedes knew that silver was lighter than gold, and therefore if the Goldsmith actually replaced some of the gold with silver while keeping the same weight, then he had to make the crown bigger. It might be easier to understand this concept when thinking of cotton wool instead of silver. Imagine the Goldsmith replacing the heavier gold with the light wool: it would take a large volume of wool to make a whole pound! Yet the difference in weight between gold and silver isn’t as significant as the cotton example, so if the crown turned out to be bigger, it would only be slightly bigger, and definitely not something a human eye could identify. Then how could Archimedes determine whether the crown contained silver?! While soaking in the bath, so the legend says, he thought of a solution. He noticed that when he got into the bath, the water level rose – meaning, his body displaced a portion of the water. He understood that the displaced volume of water must be identical to the volume of the item displacing it. That is why when a baby takes a bath, the water level increases just a bit, while when an adult takes a bath, the water level increases a lot more. Archimedes realized that in order to measure the volume of the crown, all he had to do was place it in a bowl of water and measure the water level before and after. Archimedes was so excited by this discovery that he left the bathtub and ran the streets of Syracuse – naked – while screaming “Eureka! Eureka!” which in Greek means “I am freezing! I am freezing!” Ok. Ok… It really means “I’ve discovered! I’ve discovered!“ Anyway, applying his test showed that the king’s crown was, indeed, larger than it should have been, and therefore the Goldsmith has replaced some of the gold with silver. It is likely that this story did not happen in reality, and not just because it’s unlikely that Archimedes ran naked in the streets. The difference in volume between a crown made of gold and silver is so tiny that the difference in water level would be less than zero point zero four inches (0.04). Back in Archimedes time, measuring a difference that small would probably have been, likely, impossible. Still, Archimedes did have a deep understanding of the forces that affected sunken bodies – as the following example will illustrate. King Hiero asked Archimedes to design a ship that he would later give to Ptolemy the Third, the king of Alexandria. Hiero wanted the ship – “Syracusia” was its name – to be the greatest vessel the world had ever seen: it was meant to carry hundreds of passengers and soldiers in unprecedented luxury: it would have a gymnasium, a swimming pool, and even a temple for Aphrodite! That’s impressive for a ship built today, not to mention one built in the 3rd century BC! Assuming, of course, that Archimedes could make it work… The Syracusia ship would have weighed thousands of tons. So the question was – how could Archimedes make sure such a large ship would float safely? The answer had to do with what is known today as the “Archimedes Principle”. The Syracusia, as imagined in 1798. Have you ever noticed how freight ships – those gigantic metal monsters – have no problem floating, yet when your iPhone falls into the toilet, it drowns like the Titanic? Well, that’s not Apple’s fault. The Archimedes Principle states that any object, wholly or partially immersed in a fluid, is buoyed up by a force equal to the weight of the fluid displaced by the object. Since the iPhone is small, it displaces only a small volume of water and therefore the buoyancy force – the force that pushes it upward – is smaller than the weight of the device, and it sinks. A ship, on the other hand, is concave and wide and displaces a great deal of water. If the weight of the water the ship displaces is larger than its own weight, the buoyancy force will overcome gravity and the ship will float on water even though it may weigh thousands of tons. Archimedes used this insight to design the Syracusia, and in fact, it did make its way to Alexandria. The Syracusia, by the way, demonstrated another of Archimedes’ inventions. In wooden ships, water penetrates the space between the beams; as a result, water needs to be pumped out of the ship continuously. Archimedes thought of a simple yet very efficient pump: It consisted of a screw placed inside a hollow pipe. As the screw turned, its bottom end scooped up water and pulled it upwards until it poured out of the other side of the tube. The pump is known today as “Archimedes’ Screw” – yet it was probably not invented by Archimedes – or maybe Archimedes simply re-invented it. Similar pumps existed in ancient Babylon at least hundreds of years prior to Archimedes and were used to water the hanging gardens of Babylon, one of the seven wonders of the Ancient world. Archimedes’ peaceful life was disturbed in 218 BC when the second Punic war broke out. Initially, it seemed as if Carthage would win the war. A brilliant Carthaginian general named Hannibal invaded Italy and defeated the Romans in several decisive battles. Hannibal’s success challenged the control Rome had over its allies in Sicily and convinced many to switch their support to Carthage. While in some cities rebellions broke against the Romans, King Hiero continued to be a loyal ally of Rome. Again, a smart move. Hieronymus’ decision to support Carthage resulted in a triple-sided civil war in Carthage between those who supported Rome and those who supported Carthage – and those who opposed the king and fought to rid the city of tyranny. Barely a year after taking the throne, Hieronymus was murdered and Carthage’s supporters took over the city. Unfortunately for the people of Syracuse, the Romans eventually managed to deal with Hannibal – and then turned their focus south, to Sicily and its rebellions. Marcus Marcellus and his troops invaded Sicily, defeated a small city, and then headed for Syracuse. The long period of prosperity under King Hiero allowed Syracuse to improve its defenses – and Archimedes was the engineer responsible for designing and implementing these defenses. As we’ve already heard, his innovations were greatly successful in protecting the city from the invading Romans. Archimedes was so successful, in fact, that it’s difficult to distinguish facts from myth in the story of the Siege of Syracuse. For example, it is said that Archimedes developed a way to aim a focused beam of blazing heat towards the oncoming ships. He had dozens of soldiers standing at the top of the walls while holding their shiny armors, which then reflected sunlight back to the approaching ships and set them ablaze from a distance of a few dozen yards. As dramatic as this story may seem, modern scientists doubt whether this could actually take place. Attempts to reconstruct this feat have all failed, or resulted with lighting just a small flame and only under ideal conditions. It is more likely to assume that the focused sunlight did little more than blind the attackers, at best. Even the descriptions of “The Claw of Archimedes” – those metal hooks protruding out of the walls and lifting whole ships in the air as if they were toys – are probably exaggerated. But unlike the heat-ray, there’s a reason to believe that something of this sort did take place. Why? Because one of the ideas that Archimedes studied thoroughly was that of The Principle of the Lever. It is the theoretical idea that allows us to exert a relatively small force on one side of a lever – and in return, get a much greater force on its other side. How can a lever allow a small force to be amplified to a much larger force on its other side? Well, for the sake of the explanation, let’s assume that my wife wants me to fix our garden: sweep fallen leaves, mow the grass, that sort of thing. She has two ways to make me do it. The first method is to say – “Ran, go fix on the garden.” to which I’ll probably answer – “forget the garden, I am writing an episode for Curious Minds, and it is a lot more interesting than mowing the grass.” Then she will yell at me, and I will yell at her, and eventually, as always, I will give in, give up, and go work on the garden. But my wife also has a second option. She can say “Ran, please go work on the garden.” And I will refuse. Then, after an hour, she will ask again, and I will refuse again. She will again ask, demand, harass … and eventually I will give in, give up, and work on the garden. The result will be the same but the force she has to exert – the amount of shouting and yelling – will be less. In effect, she traded engaging a great force over a small period of time – fierce yelling – for a much weaker force over a long period of time… This is the principle of the lever, and there are countless examples of it in action all around us. A beer bottle opener is a great example. Trying to open a beer bottle with your bare hands is difficult since you have to exert a great force on the bottle – but the bottle opener allows us to trade that great force for a lever that travels a longer distance and so requires a much smaller force. Archimedes didn’t invent the lever principle: It is a simple principle that many before him understood intuitively. Yet Archimedes was the first to analyze that idea mathematically and figure out its implications. He is famous for saying “Give me a lever long enough and a fulcrum on which to place it, and I shall move the world”. There is almost no doubt that he had the knowledge and ability to design a lever large enough to lift a heavy ship in the air – and if not lift it completely out of the water, then at least raise its bow and turn it on its side. Modern reconstructions show it is actually possible. Unfortunately, Marcellus’ reputation as a brilliant military leader was justified. The siege of Syracuse lasted two years, during which the general gathered as much intelligence as he could about the city’s defenses. Eventually, Marcellus got lucky. Roman supporters from inside the city told him of a three-day-festival that was about to be held in honor of the goddess Artemis. It was the moment Marcellus was waiting for. During the festival, under the cover of darkness, an elite Roman force scaled the walls and infiltrated the city. The defenders, as it turned out, were too drunk to offer any resistance – and the Roman soldiers opened the main gate and allowed the rest of the army to enter and conquer the city with hardly any resistance. The Romans sacked Syracuse and burned it to ashes. Syracuse, a once rich and magnificent city – was ruined. The second Punic war ended, eventually, with a massive Roman victory over Carthage. In the following war, the third Punic war, Rome conquered Carthage itself and destroyed it. Archimedes, too, was a victim of the fall of Syracuse. The Roman writer Plutarch wrote that since Marcellus thought very highly of Archimedes, he ordered his men not to harm the scholar. Despite the order, Archimedes found his death at the hands of a Roman soldier during the sacking of the city. One version of the story claims that Archimedes was so preoccupied with his sketches that he didn’t even notice that the city had been taken by the Romans. When a Roman soldier demanded he came out of his house, Archimedes yelled “Don’t interrupt my circles!” and in a rage, the soldier killed Archimedes. According to another version, Archimedes left his house to meet Marcellus and carried with him instruments such as a compass and large rulers. A Roman soldier mistook them for valuable jewelry and killed Archimedes in order to steal them. We will likely never know what really happened that day. A Roman mosaic describing Archimedes’ death. The dramatic Siege of Syracuse imprinted Archimedes’ image in our collective memories as that of an excellent military engineer. Yet these circumstances cast a shadow over his other significant works, such as his revolutionary discoveries in the field of pure mathematics. And it wasn’t only the political or military circumstances that determined that, but other, more random circumstances, as well. 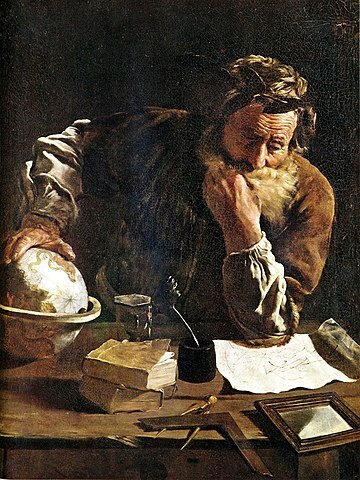 One of the achievements Archimedes was most proud of, was the discovery of a method for calculating the volume of a ball: an impossible task prior to Archimedes. He proved that the volume of a sphere contained in a cylinder – is exactly two-thirds of the cylinder’s volume; Measuring the cylinder’s volume – an easy task – would allow us to calculate the sphere’s volume. Archimedes was so proud of this success that he requested an illustration of a sphere and a cylinder to be chiseled on his tombstone. A shpere in a cylinder. How did Archimedes make this discovery? About ten manuscripts he wrote, with various mathematical proofs, survived the millennia – yet none of them explains how he came up with the basic idea of why the volume of a sphere contained inside a cylinder is exactly two-thirds the volume of the cylinder. Some might consider this information superfluous: after all, we have modern proofs for this mathematical truth – why would we be interested in knowing how Archimedes himself reached it? Well, It is a valid question – but many consider mathematics to be a sort of art, and a mathematical idea can be like a painting in a gallery. We can enjoy it as is, but wouldn’t it be more fascinating to know how the painter painted it, what tools he used, how he chose certain colors, or what ideas he had in mind? This sort of information regarding the principle of the sphere and the cylinder was lost forever – or at least that is what researchers believed until not long ago. In 1840, a European scholar named Tischendorf visited a small church in Istanbul, Turkey. He examined old books that were kept at the church for centuries, but he didn’t find anything significant – except for one book. It was a liturgical book in which he identified a few mathematical illustrations. He wrote about those illustrations in a book he published – but never continued his research. Years later, in 1899, a Greek scholar was working on cataloging all the liturgical books found in that same Turkish church. He too noticed the mathematical notations in one of the books, so he copied some of them and sent them to a few of his colleagues. These strange illustrations made their way to John Heiberg, an expert on Archimedes, and he was the first to realize that the liturgical content of the book was written on top of a previous manuscript. That is, the liturgical book is what is known as “a palimpsest”. How can a book be written on top of another? Well, the original manuscript was written in the ninth century, most likely in Istanbul – Constantinople, as it was called at the time – and was a copy of an earlier manuscript written by Archimedes himself. The book’s pages were made of hard and dry leather, similar to that a shoe sole. In the year 1204 Constantinople was conquered by the Christian crusaders and the manuscript was taken to a remote convent in the outskirts of Jerusalem. 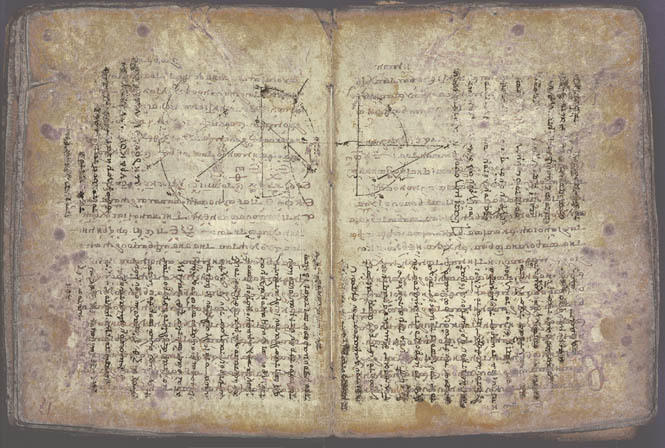 Since paper was a rare material and the monks needed everything they could write on, they choose to recycle old books and remade them into liturgical books. They would wash or scratch the ink off the existing pages until the previous content was faded and hardly noticeable, and then turned them on their side and refold them. It is likely that none of the monks realized that the old book they were wiping was actually a rare copy of an Archimedes manuscript. The monks believed that erasing pagan texts was actually a virtue and since the original book was written in Greek, they didn’t see a problem with converting it to a Christian liturgical book. The book was kept for hundreds of years in Jerusalem and then was somehow sent back to Istanbul, to the small church where it was discovered. John Heiberg then copied the pages and deciphered the faded Greek letters that hid underneath the religious prayers. What he revealed shocked him and historians around the world: a new, previously unknown manuscript by Archimedes called “The Method of Mechanical Theorems”. In it, Archimedes describes, for the first time, how he came up with many of his mathematical principles and ideas. It is a rare and exciting peek into the mind of a long gone genius. This peek exposed a fascinating fact: it turns out that in order to prove his theorem on the volume of a sphere contained within a cylinder – Archimedes made use of a revolutionary technique that was ahead of its time by fifteen hundred years: Calculus. If you don’t know much about Calculus – don’t feel bad. For our purpose, it is only important to know that Calculus plays a vital role in modern science and engineering, and was developed independently by Isaac Newton and Gottfried Leibnitz in the 17th century. Archimedes’ Palimpsest disappeared again during the First World War; scientists thought that it was lost forever and perhaps destroyed during the Second World War. But then it reappeared, held by a French family who’d kept the manuscript in their basement for years, until 1998. The book was then auctioned and purchased by an anonymous buyer for two million dollars; he donated the manuscript to a museum where it is kept today and made accessible for scientific research. Even today, X-ray and Infra-red scans still reveal new details from the book. But, that’s life, you know. All we can do is sit back, grab a beer, open it using a long lever and a proper fulcrum – and drink in honor of this special man, Archimedes of Syracuse.